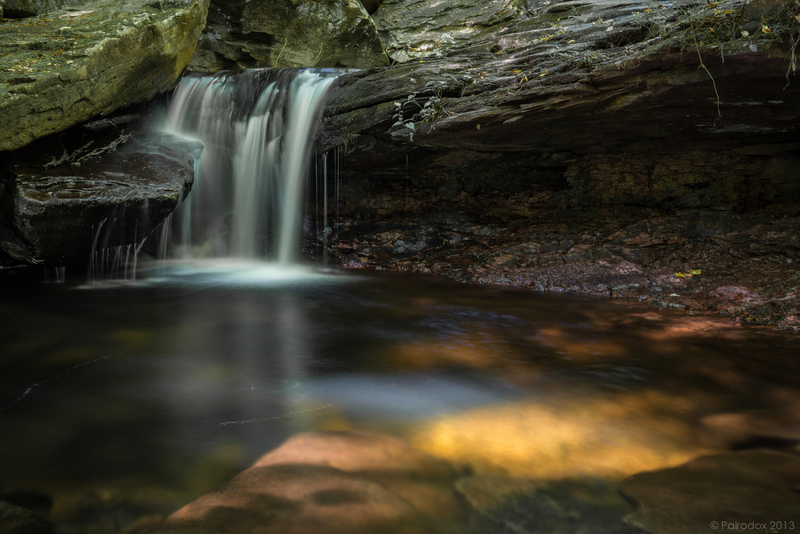 Here’s another view captured along the Falls Trail at Rickett’s Glen State Park. I particularly like the illuminations in the foreground. If you click on the image for a higher resolution view you will see several thin squiggles on the left side of the foreground. These are the recorded movements of insects as each skimmed across the surface of the water during the 10 second exposure required to capture this image. Whenever I stand by water, whether it be a waterfall such as this, an ocean shoreline, a creek side, or the large tank from which our sheep draw sustenance, I cannot help but return to some thoughts about water that I have quite often; that few of us have a true appreciation of the fact that water sustains life as we know it, and water is really amazing stuff. Much has been written about the narrow physical and chemical limits within which liquid water can exist. I recently read a fascinating discussion of the strength of the hydrogen bond the conclusion to which was that it must exist within a narrow window (5-30 kJ/mole) for life to exist. The dashed lines in the image above show how these bonds form between water molecules. It is unsettling to consider that a 29% decrease in the strength of the H-bond would cause water to boil at 98.6ºF and an 18% increase in its strength would cause water to freeze at 98.6ºF. Hydrogen bonds are weak interactions which occur between a hydrogen atom attached to an electronegative atom, such as oxygen, and an electronegative atom of another molecule. Such bonds are responsible for the phenomena of surface tension (allowing leaves to rest upon a pond’s surface and certain insects to walk-on-water) and capillary action (drawing water up thin tubes and against the downward force of gravity). Water’s high specific heat and its high heat of vaporization allow the earth’s oceans to buffer and to protect the planet from dramatic changes in temperature. One of water’s most unusual properties is that it reaches its maximum density at 4°C while it freezes at 0°C. Ice is less dense than fluid water at 4°C because in the liquid state water molecules are, on average, bonded to 3.4 other water molecules while as a solid they are bound to four other water molecules. The physical interactions among four players, rather than 3.4, dictate that these can pack less closely and solid water is therefore less dense than liquid water. And all of us can remember learning in grade school that if water did not display this unusual property the world’s high latitude fresh waters would freeze from the bottom-up with negative consequences for all resident organisms. Even DNA, the genetic material itself, relies on hydrogen bonds to hold its complementary strands together. Although the animated DNA looks pretty it does not show these important bonds which form between the bases (in purple and in the center of the rotating molecule). For a split second the void between adjacent bases can be seen and this is where the H-bond should be. Unfortunately, the modelers left this detail out. These tenuous attractions are key to keeping DNA together and, ultimately then, the transmission of genetic traits, reproduction, and life. The fact that water’s remarkable properties allow life to flourish on this planet is undeniable. Does it then follow that the planet was made for us? Indeed, this argument has been called the Anthropic Principle by some and the Principle of the Fine-Tuned Universe by others. Does evidence of preordination or mindfulness imply the existence of a larger consciousness somewhere among the stars? As the philosopher would say, these are explananda in need of explanana. Mark Twain’s wonderfully irreverent essay Was the World Made for Man? was written in response to the claims of Alfred Russell Wallace, with whom Darwin shared claim to being the first to describe the mechanism of Natural Selection, that intelligent life lay foreshadowed in the laws of nature. I have taken the following quote from it. Forgive Twain his 1903 view of Earth history. I have added, in square brackets, more current estimates of these numbers. … Man has been here 32,000 [200,000] years. That it took a hundred million [4.5 billion] years to prepare the world for him is proof that that is what it was done for. I suppose it is. I dunno. If the Eiffel Tower were now representing the world’s age, the skin of paint on the pinnacle-knob at its summit would represent man’s share of that age; and anybody would perceive that that skin was what the tower was built for. I reckon they would. I dunno. Postscript. Soon after this post was published my favorite physicist Elke, at Theory and Practice of Trying to Combine Just Anything, provided a link to a nicely presented synopsis of the Anthropic Principle provided by two theoretical physicists, Sabine and Stefan, at Backreaction. The internet a wonderful thing indeed. Thanks Elke, Sabine, and Stefan.